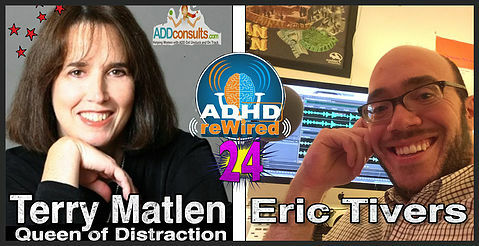 Terry Matlen is a psychotherapist, coach and author, and runs a number of websites including ADDConsults.com On this episode Terry talks about her challenges and how she’s learned to create accommodations for herself and her family. Despite hitting the occasional bump in the road, Terry shares how she was able to shift from the mindset of “what’s wrong with me” to acceptance with a focus on her strengths. We talk about the challenges of travel with ADHD. Go check out her blog post she wrote about this. It’s really worth reading. We also talk about learning to make accommodations for ourselves, which includes asking for help. Terry shares with us a few tips from her upcoming book “Queen of Distraction,” which is due out in October.